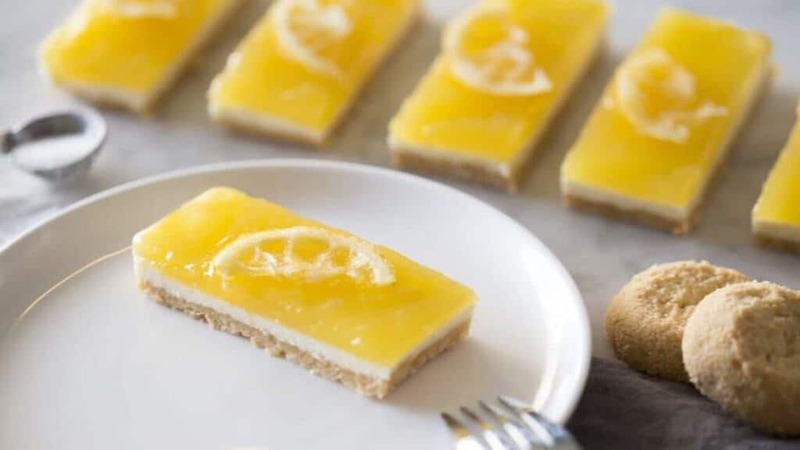 It’s basically REALLY HOT today so instead of turning the oven on, I made these no-bake lemon cheesecake bars! The cookie crust, creamy cheesecake middle and zingy lemon curd made for a great combo. Cool and refreshing for a scorching weekend. Yum! Am I right? If you’re a lemon lover then you’ve got to try my lemon elderflower cake! Here’s the link for the pans if you want to pick up a set! 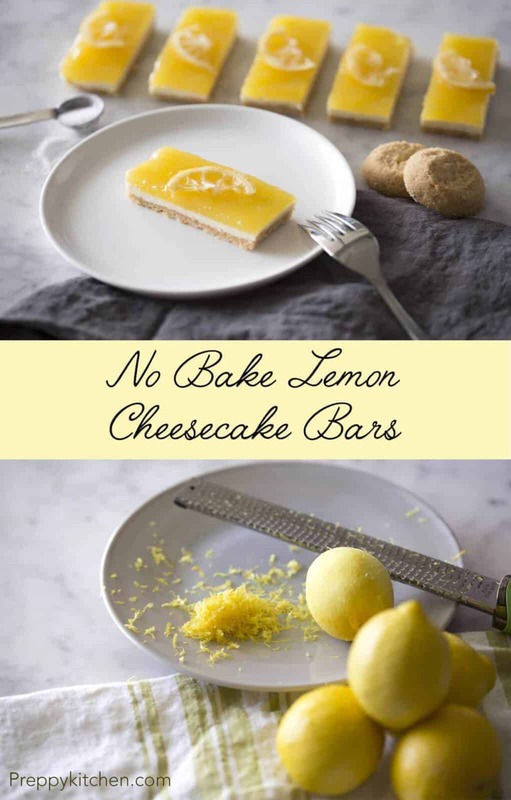 If you’ve tried these no bake lemon cheesecake bars then don’t forget to rate the recipe and let me know how you got on in the comments below, I love hearing from you! A refreshing treat with a tart kick. 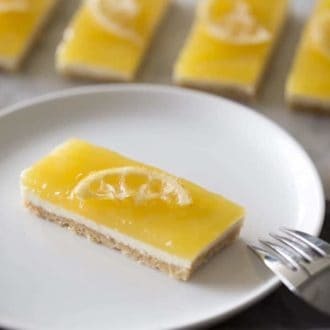 Cookie crust, no bake cheesecake and lemon curd. Crush the cookies in a ziplock baggie. Press into foil-lined pan, then chill. Mix cream cheese, condensed milk, lemon juice and vanilla. Smooth the mixture into the pan and chill. Zest the lemons, then juice and strain them. 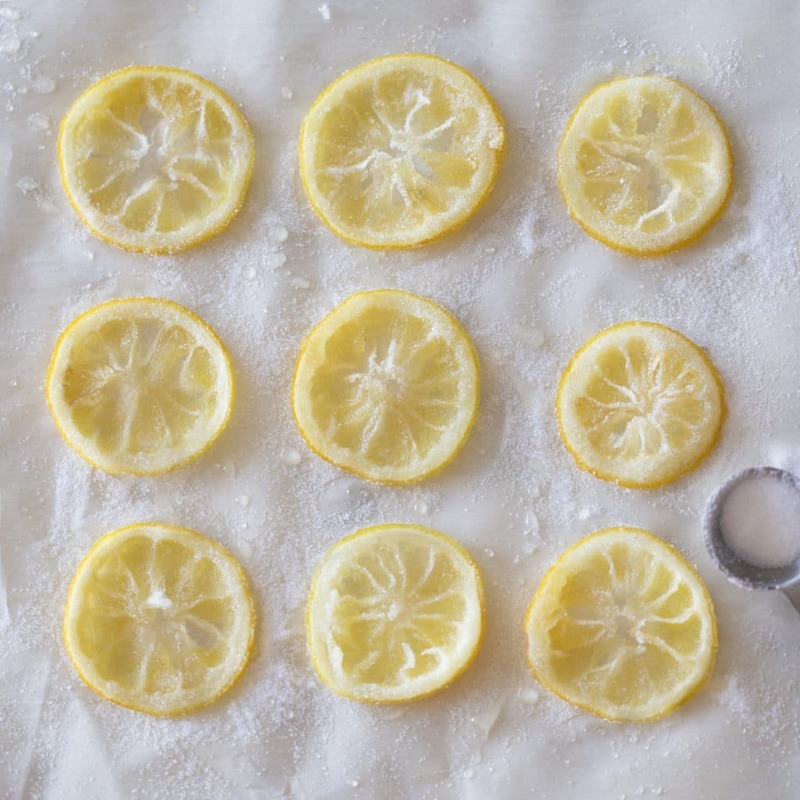 Add the sugar and lemon zest into a food processor or blender. Pulse until the zest is very finely chopped. 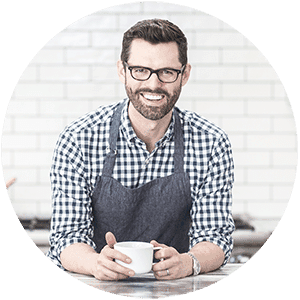 In a standing mixer, transfer blended mixture and add the eggs one at a time while mixing at medium speed. Add about 1/2 cup of lemon juice and salt. Mix until combined. Transfer to a pan and cook over medium low heat. After about 15 minutes of constant stirring, the curd will come together and thicken. Spoon the warm lemon curd over the crust. Chill for about 30 - 60 min. Cut into even slices. Enjoy! Can you tell me what size pan this is.. These are little Wilton 10 x 4 inch pans. How do u make the lemon curd ? Hi Nancy — I’ve updated the recipe. Take a look and let me know what you think. Thanks, John. I dont see the instructions for cooking the curd – are you sure they are on the site? Hi I live in Australia and there is no graham crackers, do you know a substitute and do you think Marie biscuits will be fine as a substitute? Hi Paige — I’m sure it’s fine! Thanks, John. This is a lovely cheesecake but what I really love is this curd. I have tried so many curd recipes and they all taste eggy but this one is delicious and super easy to make. I followed the directions for your orange curd recipe which is yummy as well and it turned out perfect. I love this curd on yogurt with berries. Thank you so much! If you liked this curd, you should try making my creamsicle cake! It has an orange curd that I know you will LOVE! Hi there! Can you post a link to this cutie little pan? I love when you use it, but I can’t find it anywhere! Here is the link to the pans! I hope you enjoy this summer treat! In looking at the nutritional information for these bars it says each bar has 1.7 grams of sugar. Is that a typo? It seems like such a scant amount for this recipe . Thanks for any info!